A couple of months ago, I was reading a lot of contemporary romances. Yeah. Me. I am very picky about the contemporaries I read but I got sucked into reading contemporaries in August so I picked up Love Will Always Remember by Tracey Livesay. I am not a fan of amnesia stories because they are really difficult to pull off and I was right. Tracey Livesay created a believable and compelling story but I still felt iffy about it. Because, how could you lie to someone who has amnesia by pretending that you’re something you’re not, if not for personal gain? Yes, this lie started because of a good reason but it didn’t have to be perpetuated for most of the book, right? Leighton Clarke is in a coma and can’t seem to remember anything in the last six years. Which means she did not know that she was engaged to be married. Until she was introduced to her fiancé, Jonathan Moran who is her faux fiancé! Jonathan is her fiancé’s younger brother who pretends to be her fiancé in order to get in the ambulance to be with her and be with her at the hospital – because, immediate family members only. I may not have as much experience in an acute setting as most nurses, but if you tell the staff that you are her future brother-in-law and the patient’s fiancé is out of the country, I don’t think they would bar you from being there, right? I should think not. But anyway, this is what happened. When Leighton wakes up, she is immediately told who her fiancé is. And what’s more, faux fiancé had the GREEN LIGHT from her real fiancé to pretend because he was too busy to fly back to the States to be with her. I know that was done intentionally so we would hate the REAL fiancé but I actually hated Jonathan even more. It is revealed early on that Leighton and her fiancé’s relationship was totally a power play. They were not in love and had planned for their marriage to be one for convenience. But despite this, I still did not like the lies perpetrated by the brothers. Not only that, but Jonathan still perpetrated his ruse EVEN up to the point of sleeping with her! NO, no and no. Don’t get me wrong, I liked reading this book well enough but still! However, I did enjoy how the romance between Leighton and Jonathan developed. In the first couple of chapters, Leighton was really painted as very cold and power hungry but she was a totally different person while she had amnesia. Leighton’s growth as a person was very well done and also her reconciliation with her estranged mother and also the revelation of her late father’s infidelity. Despite all of these, there were sweet and heart-wrenching moments and I ended up liking how Leighton and Jonathan’s romance developed, even if I still thought that what Jonathan was doing was wrong on so many levels. Sure, he fell in love with Leighton and didn’t want to lose her, but WE KNOW that his lies would be revealed in the end. What I did love is the character development, most especially Leighton’s. She really endeared herself to me and I liked how she changed as a person who was full of hate. Another thing that I loved is that this book features an interracial romance but it wasn’t obvious and I found it very refreshing! This is the first book by Tracey Livesay that I have read and I am intrigued. I will definitely look into her backlist. 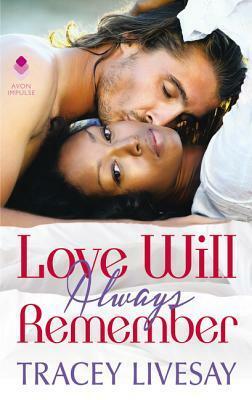 If you have read Love Will Always Remember, what did you think of it? Do you like amnesia stories? If you have read Tracey Livesay before, which book should I pick up next? Tracey Livesay wrote her first romance novel at the age of eleven, called “The Healing Power of Love.” With a detour through college and law school–where she met her husband on the very first day–she’s finally achieved her dream of being a published author. She lives in Virginia with said husband and three kids. For info on her upcoming releases or to chat about TV, movies and/or purses you can check out her website (traceylivesay.com) or find her on Facebook (TraceyLivesayAuthor) and Twitter (@tlivesay). Hmm, at first I thought the premise could be amusing, but once you said the faux fiancee slept with the woman under the guise of actually being her fiancee!!! That’s a little creepy. LOL. I don’t know how/why you gave this one three stars! It sounds like a two-star read to me. I also really dislike amnesia romances but this one sounds particularly awful. Uuuuggghhhh. I want to bleach my brain a little. Hopefully your next read is better! I gave it an additional star because there were some aspects that I liked and also the writing is really good. The only thing that was iffy was the lies… gaaaaah and also I liked the chemistry between the two… so I was torn!